Size : 11.0 x 16.9 inches. / 28.0 x 43.0 cm. 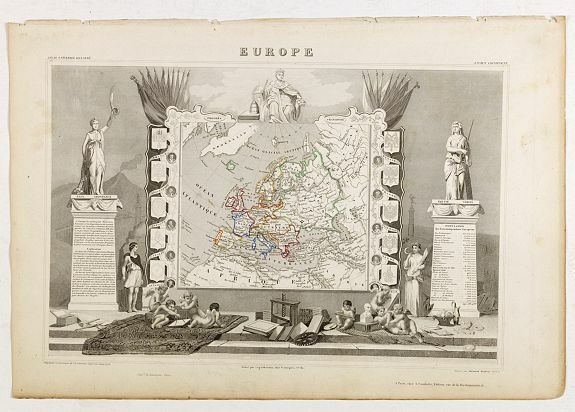 Description :While the map itself is quite simple without a great deal of detail, the surrounding engravings make this one of the most decorative 19th century maps. The map is framed by medallion portraits and coats of arms down each side and is set against a background of statues and allegorical figures with a large group of adorable cherubs engaged in academic pursuits filling the foreground. Surrounding scenes in full later colour.